It’s been a cold week all around the country. I have a bit of problem that no matter how cold it is, I won’t turn the heater on in our house until at least 5pm. But I don’t have an issue heating the house in other ways. I do wish we had fireplace or even a wood burning stove/heater, but alas, we have a tiny house and no space for either. What I do have, however, is a big hunk of steel in the kitchen in the form of my Wedgewood stove. Unlike other stoves I’ve had, the whole unit gets hot Hot HOT when it’s on and it can warm our entire small house. Don’t worry, though. I’m not about to just turn it on for no reason. Having a 16 year old boy in the house means that we go through food faster than I ever thought possible. Food that you would think would last at least a week are lucky to make it 2 days around here. So if I want to make a batch of granola it is in my best interest to make a very large batch. This batch will probably last the average household a month. Here we’ll get maybe 2 weeks out of it. 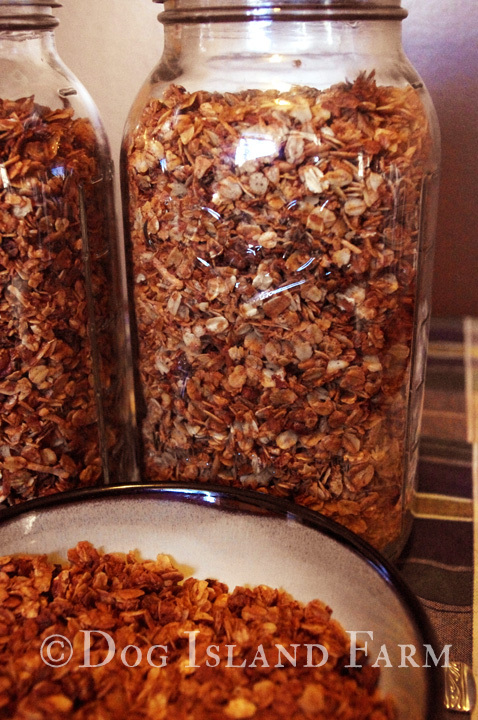 Since I don’t have a whole lot of spare time to make granola every few days I have to make these large batches. It takes a lot less time to make a big batch compared to multiple regular sized batches but if you want to cut this recipe down it’s easy to do. One of the ingredients you will see might make you scratch your head. I learned to add this from a recipe I once made for cinnamon rolls. It helps create a more complex flavor profile, so don’t worry and trust me, you’ll love it. Preheat your oven to 275*F and line two baking sheets with parchment paper. In a very large bowl mix oats, pecans, coconut, cinnamon, salt and pepper together. Add oil and honey to the dry mix. It works best if you measure out the oil first and then use the same measuring cup to measure out the honey. That way the honey just pours out without sticking to the measuring cup. Mix all the ingredients well until the honey and oil is well incorporated and all the dry mix is evenly coated. Pour the mix onto the baking sheets and press it down in an even layer. Bake in oven for 30 minutes. Mix up granola, bringing the outside edges in and pack it back down into an even layer again. Switch sheet locations and bake another 30 minutes. Repeat this one more time baking for a total of 90 minutes. Allow to cool completely and then break up into chunks and store in an airtight container.